Some of these victims will be living in your area. With the right training your force can help make a difference to their lives and to the lives of their families. 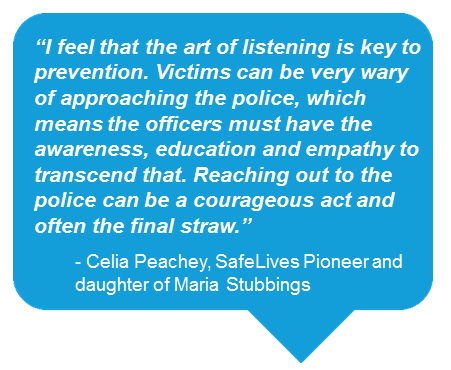 At SafeLives we are passionate about ending domestic abuse and have over ten years’ experience providing training to frontline professionals who come into contact with victims. In 2014 a report by the HMIC, Everyone's business: Improving the police response to domestic abuse, called for a review of the training offered nationally to police forces on the subject of domestic abuse. To address the issues raised, SafeLives has worked with the College of Policing to develop a new domestic abuse change programme: Domestic Abuse Matters. The programme was developed following consultation with various police forces and domestic abuse organisations and a review of the existing products offered by the College of Policing. It includes a College of Policing licence to ensure future proofing and sustainable change. We are committed to ensuring that this programme delivers real, sustainable change that makes a difference to police practice, and to the support that victims of domestic abuse receive. That’s why we’re evaluating progress as we go. 1 ONS (2015), Crime Survey England and Wales 2013-14. London: Office for National Statistics. 2 SafeLives (2015), Insights Idva National Dataset 2013-14. Bristol: SafeLives.